Travel London like a local! 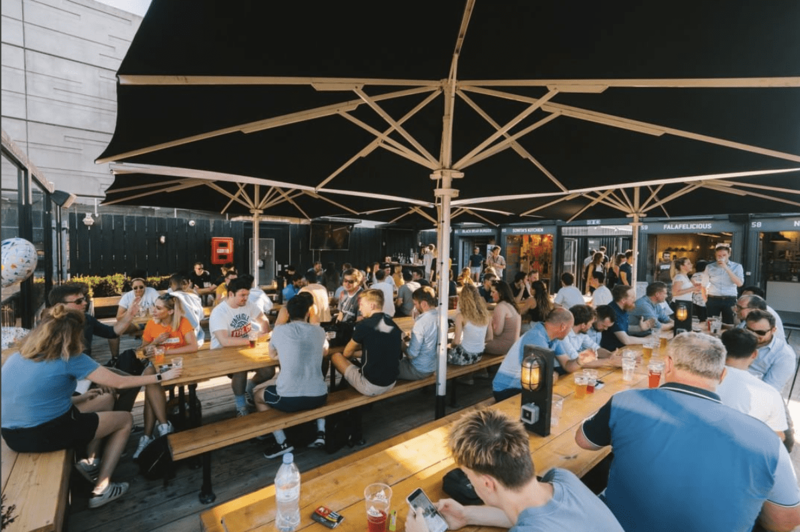 London is a vibrant and busy city and it can be quite daunting trying to find good places to eat, drink and go when there are so many options - but don’t worry we are here to help! We have set up the ultimate London local travel guide which features the best places to go during your visit with us, so you can make this a trip to remember! Be sure to check out our Instagram or Facebook to meet Aziz our receptionist at Safestay Holland Park. He’s got some great recommendations on his experience at all the places we’ll be mentioning! 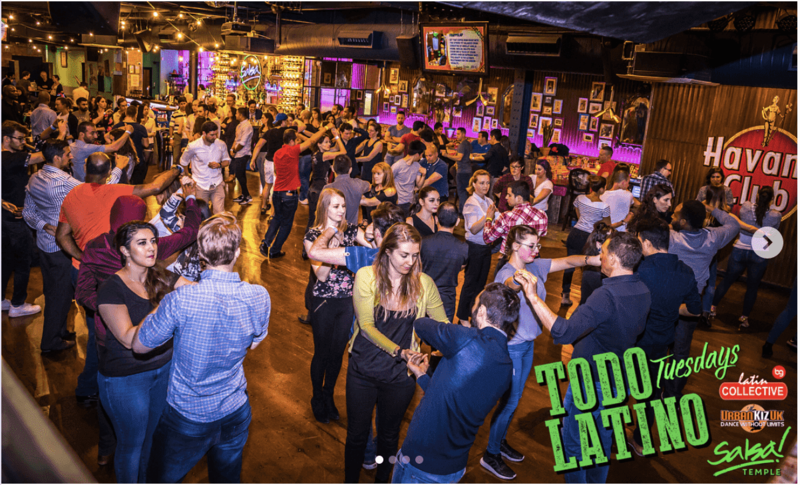 If you fancy a lively night full of fun and action, Salsa! Temple is definitely for you. With daily dance classes and the infamous Festa Fiesta Monday’s, there is always more to do than just eat and drink! The extensive drinks menu ranges from flavoured mojitos to signature cocktails, to whiskey and wine. Be sure to visit the bar between 5 pm and 8 pm every day as it is ‘happy hour’ between these times – who wouldn’t want 50% off their drinks! 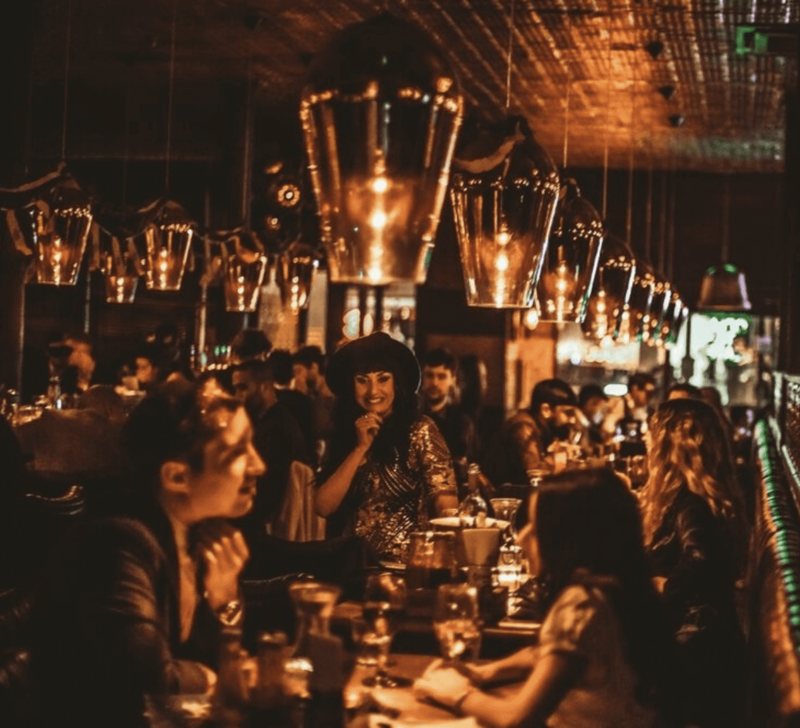 Whether you are hosting a party here with a group of friends or going here solo, the lively atmosphere, great drinks and tapas is definitely not to be missed! Look how fun these dance classes look! The Blues Kitchen is full of southern hospitality with live music events every night of the week, ranging from blues to soul music and celebrations of artists such as Aretha Franklin and Johnny Cash. The drinks have a southern theme with many Kentucky bourbons and Tennessee whiskey. The bar is open for brunch and also for late-night drinks – perfect to visit at any time of the day! 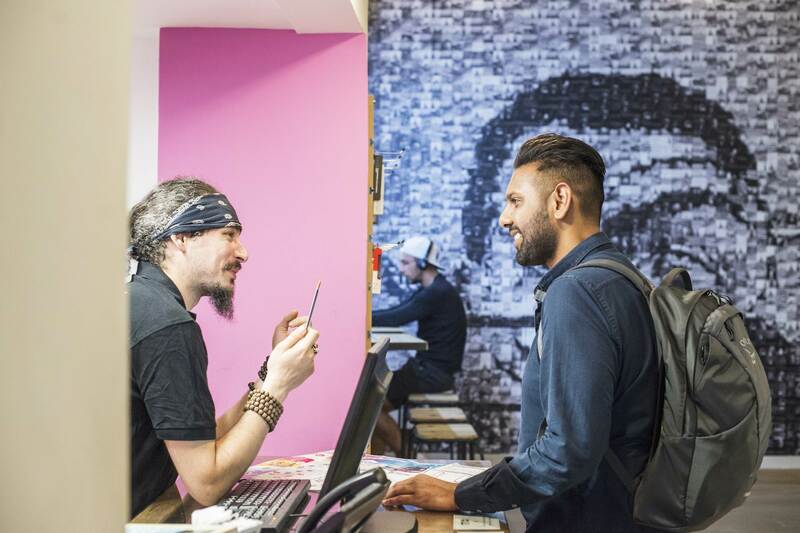 Known as the world’s first pop-up mall, Boxpark Shoreditch is a great place to come to shop, eat and drink! 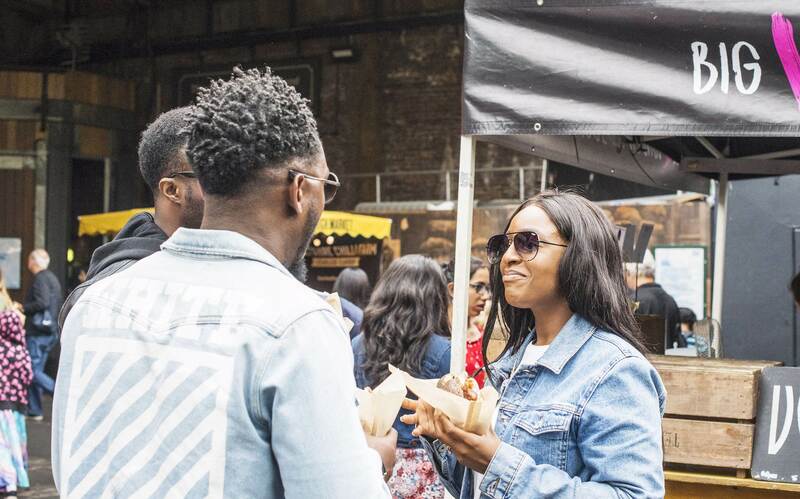 There are plenty of street food market stalls where you can grab a cocktail, a beer – or if you prefer no alcohol – a coffee, milkshake or bubble tea. The friendly inclusive atmosphere makes it a great place to come to hang out at lunchtime or in the early evening. It is a great place to come to unwind and enjoy your day! 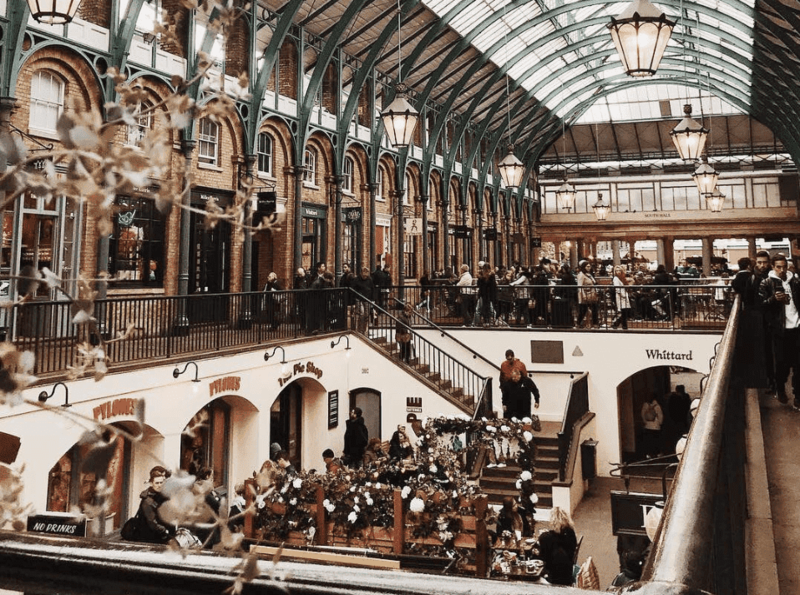 Covent Garden is a great place to visit if you are looking for some meal inspiration as there are an array of restaurants, cafes and pubs to choose from. If you fancy some fine dining then the famous Clos Maggiore is the perfect setting. Their French inspired menu has plenty of choice of poultry, fish and vegan options and is voted as London’s most romantic restaurant – be sure to ask for a table in the conservatory as there is a beautiful flower roof – perfect for that ultimate date night setting! Other restaurants in Covent Garden include the famous chain restaurants of Wahaca, Wagamama, Bill’s, Shake Shack and Pizza Pilgrims. If you’re vegan, the famous byCHLOE can be found in Covent Garden where they offer an entire menu full of vegan delights – one that should definitely not be missed! Hours Although the markets are open 9am-5pm every day, the best days to visit for the best food stalls are on a Friday and Saturday! 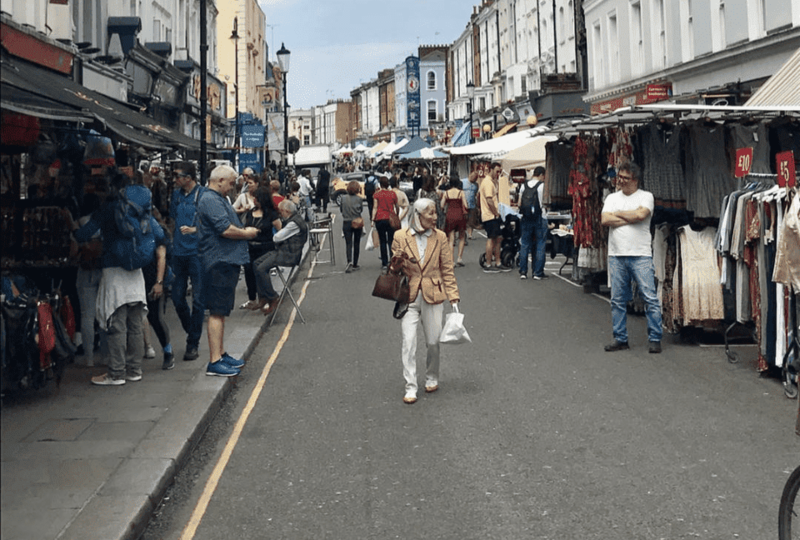 If you love being adventurous with your food, then Portobello Road market is a definite must for you! Boasting a range of different stalls and cuisines, there is enough choice to satisfy everyone. Be sure to visit the food stall ‘Jamon Jamon’ for a fantastic paella! A falafel stand runs every day of the week, and on Fridays and Saturdays, you can feast on a range of foods such as churros, bratwurst, curry and crepes! Once you have finished eating you can visit all of the authentic food, fashion, jewellery, toy and book stalls – here you will be able to find the perfect memoirs of your trip! Established in 1974, this iconic bagel shop is a favourite among locals and tourists. Open 24 hours a day means anytime is good to visit this shop, whether, for breakfast, lunch, dinner or a midnight snack! You can feast on the bagel treats whenever you fancy. 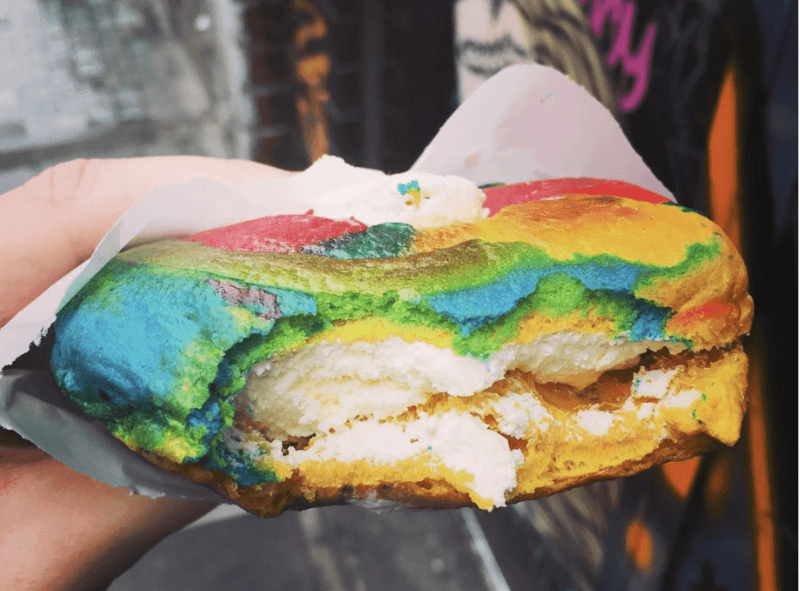 Here they serve the very ‘instagrammable’ rainbow beigels and their famous salt beef beigels are the hit seller and not to be missed! 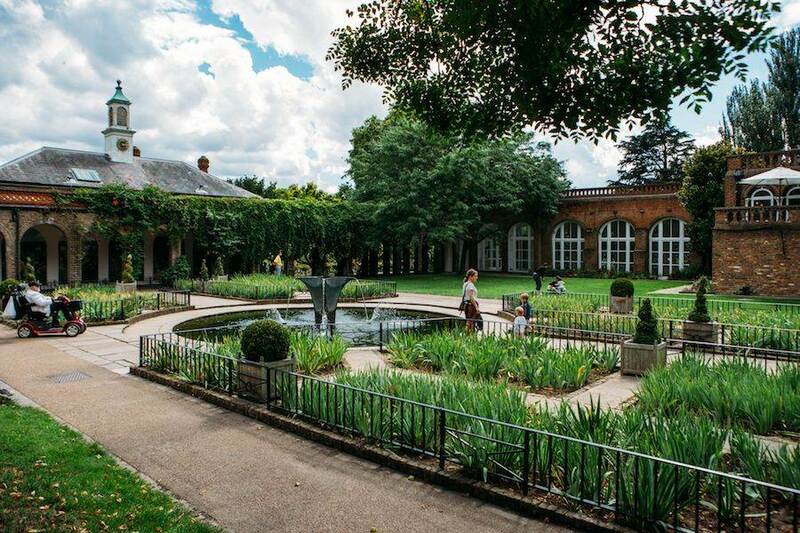 Holland Park is right next door to SafeStay and is the perfect place to visit if you fancy a walk and fresh air. Within the 22.5 hectares of the park is the beautiful Kyoto garden which is a Japanese garden donated by Kyoto in 1991. If you are going to the park for some exercise you can join in on some health walks and the park provides great spaces in which you can play tennis, football and cricket – perfect for sports fans! The vast grounds of Hyde Park make it a great place to walk around and take part in plenty of activities! If you are feeling brave you can take part in an open water swim in the Serpentine or if you’d like to stay dry – you can boat across the lake in either a rowing boat or a pedalo. Hyde Park is the home to the Princess Diana Memorial Fountain – this idyllic setting is perfect to take a moment to reflect. The park’s extensive grounds are great if you fancy a leg stretch and want to walk or jog around the premises. Even better, when the weather is hot, Hyde Park is a great place to hang with your loved ones and share a picnic! 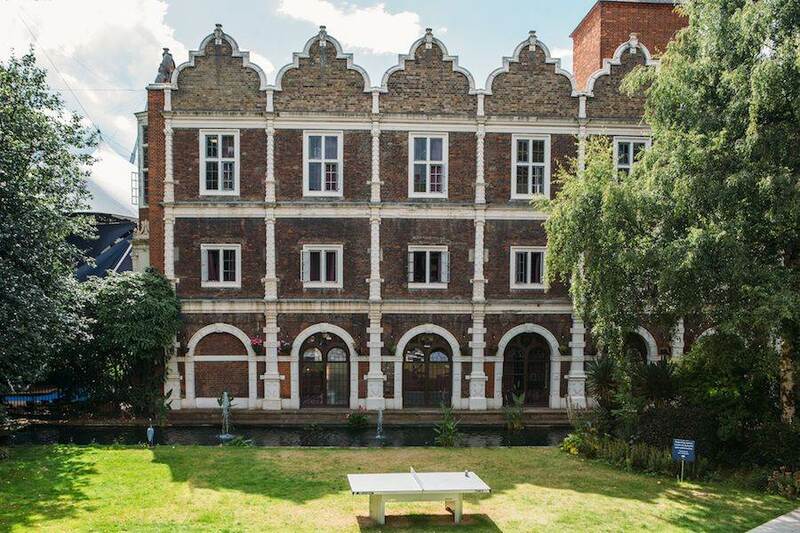 Our hostel in Holland Park is a beautiful building that originates from the Jacobean era. We have three buildings, including the East wing. You’ll be able to get a bit of a historical element to your pictures! But the best place to take a picture during your stay would have to be in the hostel’s garden courtyard. The beautiful green space provides a natural canvas to your perfect pics! Kyoto Gardens is in the heart of Holland Park and was a gift from the city of Kyoto to signify the friendship between Japan and Great Britain. 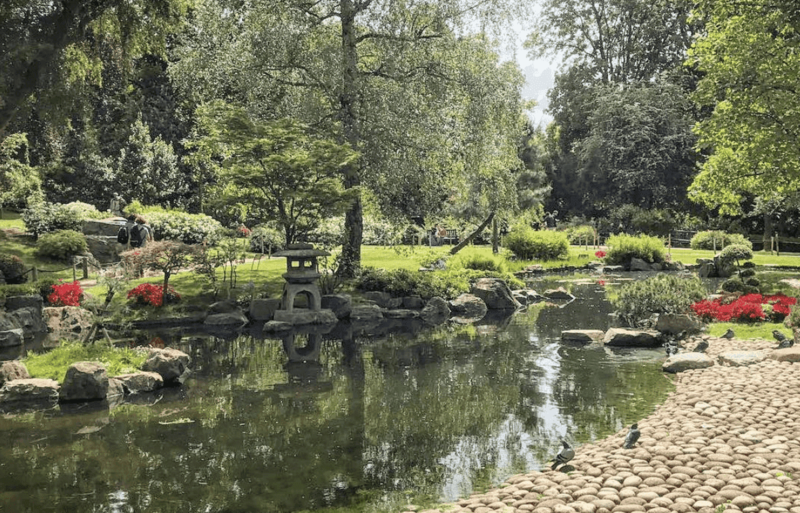 The gardens are truly a great place to unwind but even better to grab the best pictures as the gardens feature beautiful bridges, waterfalls and ponds full of koi carp. The stone bridges and colourful trees will provide the best backdrop for that Instagram shot! Want more Instagram spots? Well here is 13! Can’t wait to come to London Holland Park? Well, book now!